By Peter J. Lysy, Archivist, University of Notre Dame. Civil War flags embodied the spirit of the units they led, and few units of the Union Army displayed such spirit as the famed Irish Brigade. From 1862 to 1865 the brigade built and confirmed its reputation on battlefields with names like Antietam, Fredericksburg, and Gettysburg. 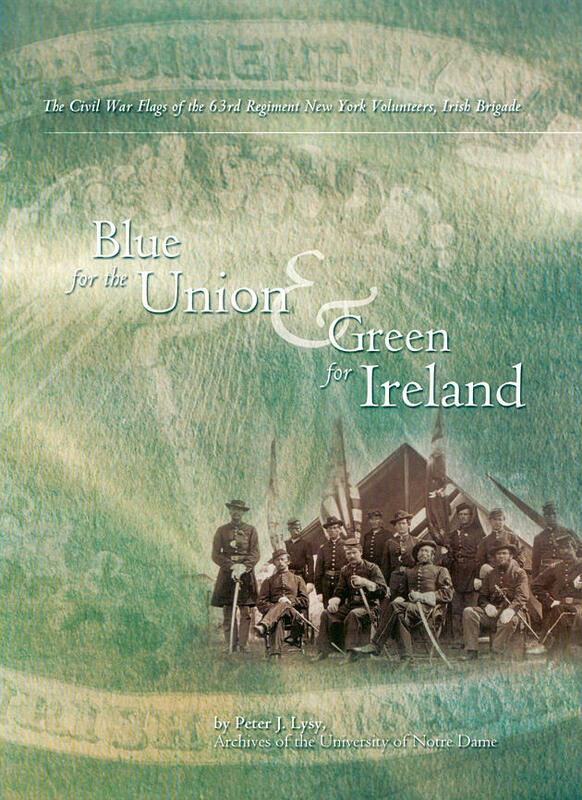 Blue for the Union and Green for Ireland focuses on the story of the nine wartime flags of the brigade's 63rd New York Volunteers. Besides documenting the succession of flags that led the regiment, this book places the presentation and retirement of the regiment's flags in the larger context of wartime Washington and New York politics and illustrates the complex relationship among the soldiers on the battlefront, the citizens on the homefront, and the assorted politicians and local leaders operating inbetween. 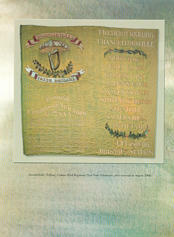 Going forward after the war, the book follows one of the regiment's flags  the extravagantly elegant Second Irish Colors, a product of the world-renowned Tiffany & Co.  as it traveled first to Virginia and then to the University of Notre Dame where, over the course of a century, it declined from venerated relic to deteriorated historical curiosity before being professionally conserved in 2000 and restored to its proper place as a respected historical artifact. 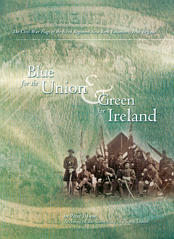 Blue for the Union and Green for Ireland: The Civil War Flags of the 63rd New York Volunteers, Irish Brigade employs a combination of historical narrative, annotated historical documents, richly-captioned illustrations, and scrupulously detailed endnotes to bring this story to life, starting with the very birth of the Irish Brigade in 1861 and continuing through to the restoration of the Second Irish Colors at Notre Dame in 2000. This short volume is packed with history, analysis, and original documents sure to be of interest to anyone who enjoys the Irish Brigade, the Civil War and its flags, the Irish in America, or the University of Notre Dame. Soft cover, 8 ½" by 11", 60 pages, 61 illustrations including 35 in full color. Price $16.95 plus $3.50 shipping costs.